Composed by Tom Shelton. Hinshaw Secular. Secular. Octavo. 16 pages. Hinshaw Music Inc. #HMC2490. Published by Hinshaw Music Inc. (HL.8764909). 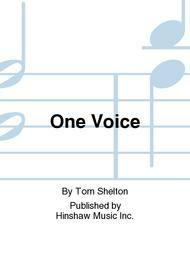 This lyrical composition provides many opportunities for developing musical and non-musical skills and understandings. It was commissioned for the 2014 North Carolina Elementary Honors Chorus, but is also suitable for adult women. With violin.